Fairly remote Utah climb from Parowan to Brian Head ski resort. Ride 14 miles gaining 4,384’ to elevation 10,419 at 5.9% average grade. 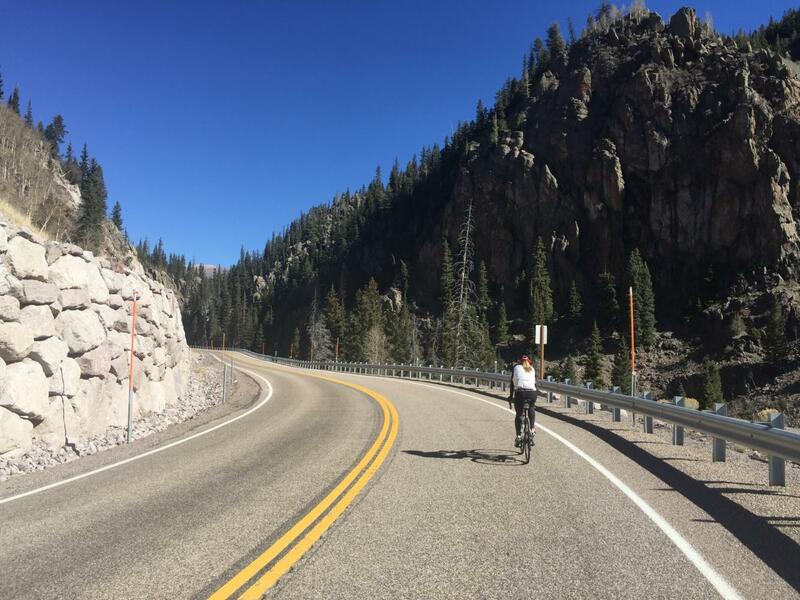 The Hwy 143 climb starts near Parowan in the fairly remote southwestern section of Utah, sandwiched between 2 other Top 100 U.S. Climbs, Climb #73 Hwy 153 37 miles north and climb #71 Kolob Terrace Rd 68 miles to the south.. The first 6 1/2 miles of this climb are a good warm up at 4.8% while the next 4.5 miles ramp up with an 8.4% average grade (10.2% average grade for the steepest part of the climb - 1.7 miles from mile 9.4 to 11.1). Our view is primarily of forest as we climb 11 miles up to the tiny ski resort community of Brian Head. The 3 miles through and beyond Brian Head are more open and less wooded as we are beginning to move close to above tree line. Top of the climb looking back - steep grade to the top. Roadway-Traffic Report: Very good roadway, but it is a highway, so we do encounter light but fast traveling traffic with minimal to no shoulder to ride on. Cycling Hwy 143 - ride in Fishlake National Forest up and past Brian Head. This is a top Utah and US bike climb. Other climbs within a 25 mile straight-line radius of the start of this climb are Cedar Canyon and Cedar and Right Hand Canyon Roads.. Access these other climbs by clicking "Routes in Area" on button below or the climb card above right.